First days’ climbing in Tenerife. Wake up, wander down for breakfast and walk out to a beautiful clear sunny morning with the temperature already 20degrees. Must be dreaming! Then I remember the the four and a half hour flight to get us here. Getting immediately lost in our hire car, in the dark, on the the strange road layouts from the airport.There was a quick rush for a bite to eat and then sleep. The apart-hotel we have booked into proves every bit as good as the brochure said. The three of us have a two room apartment with kitchen and bathroom. There is a large restaurant providing us with buffet breakfasts and dinners, why cook when on holiday? Our terrace leads straight onto the pool area and catches the sun. 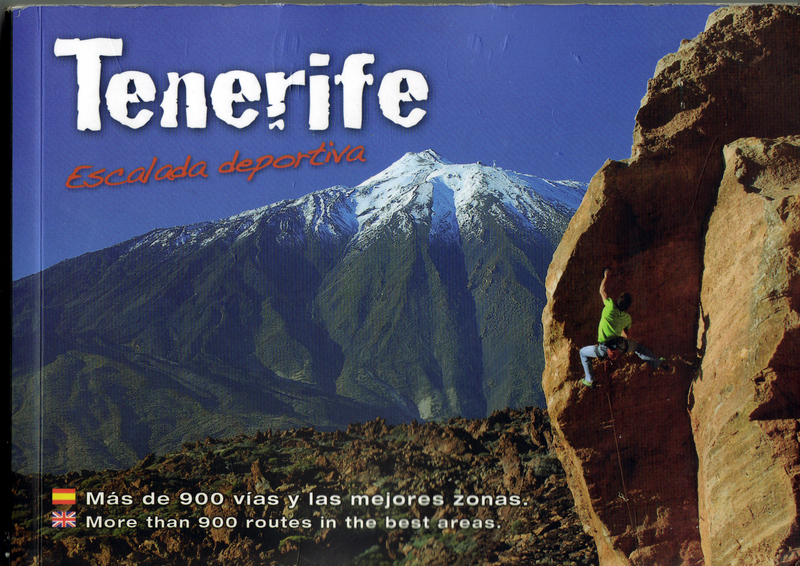 We are situated in the middle of some golf complexes on the SE corner of Tenerife – never expected to be here.Instead of a pre Xmas climbing trip to southern Spain, the weather can be dodgy in Dec, and encouraged by a newish guidebook we have opted for a look at the climbing on the Island of Tenerife. The first morning we headed out to an area that promised easy access, good climbing at all grades with sun or shade all day. Parking up we realised from the number of cars that everyone thought the same. ARICO was a rocky gorge composed of volcanic rock. A short descent into the gorge and climbing was possible on both sides. Reading the guide book there were some low grade climbs on sector Los Quintos, a buttress on the right a short distance up the gorge. Quickly identified and with the sun shining my enthusiasm was high for the start of our climbing. OK they did look a bit steep and polished. Chose a IV+ [La Guarra] and immediately found the climbing hard. The wall was vertical and one relied on small pockets to make or not make progress. The adjacent V- was no better and we ended up top roping the next V! Not a good start. Made the usual excuses of jet lag, undergrading and polished popularity. Then moved quickly up the gorge to some easier angled V grade climbs which restored our confidence in the grading system. When it was too hot on the right side we moved over to the shady Pena del Lunes sector where a longer V+ pocked wall completed the day. A quick drive down the motorway brought us back to the hotel just as the sun loungers were being vacated. The outdoor pool turned out to be heated so the evening swim was refreshing and became part of the holiday routine. Having a kitchen was ideal for brewing cups of tea whilst we relaxed before dinner – must keep up the British tradition. The restaurant was quiet, most people seemed to be speaking with an eastern European accent. We have become experts over the years at an evening grazing hotel buffet suppers. Start with a bowl of gazpacho soup, a plate of salad before a little fish or shellfish course, a selection from the main meals and to finish some fruit or flan. This hotel produced a better than average selection and had a chef cooking meat and fish every night. Not sure all this is good for the climbing. Armed with the ‘guide’ to LA MARTELA gorge we drove further up the mountain to a parking spot. Small cairned tracks, through wild scenery, led us to the lip of the gorge and we dropped into its depths. This area is much more enclosed and composed of a more compact, smooth, basalt type rock. We left the sun behind and it was quite cool down here. Somewhat chastened from yesterday’s warm up climbs we started on an easy IV+ [Carnaval Amargo] and all went well. Next up was the adjacent V+ which proved a bit trickier but excellent climbing on the smooth, hold-less rock. The day had moved on and we had not noticed the dark clouds above [Its always sunny here!] so when we felt the first few drops of rain we settled under an overhang and ate lunch. No one else appeared. Expecting things to improve, weather wise, we sat on and gradually everything around us became wet with no hope of drying out. Admitting defeat we packed up and climbed out of the gorge contemplating on the seriousness of being down here in a real deluge. When we arrived back at the road we could see we were under a nasty little black cloud producing the rain. Making the most of the afternoon we motored to another crag not in the guide book, Jama, near the village of El Roque. When we found the rocks they turned out to offer short routes in the the lower grades. For another day maybe. This entry was posted in Canary Islands., Climbing and tagged Canary Islands, Climbing, Tenerife on December 19, 2012 by bowlandclimber.